One of the best part about being a member of the bookish community isn’t the books, it is the intense relationship we have with everything tied to our books. These are the things that make up our handshake-wink-lapel pen of the book girl (or boy) secret society, a tiny mark that screams “I’m one of you!” to those who will only quietly judge a book by its cover. I’m just sad I don’t already own all this stuff! I’ve been waiting, patiently with bated breath, for this Kickstarter campaign item to arrive in my mailbox for a year. I have not gone postal for only 2 reasons a) the Pemberley Digital team is very honest about the delays b) they will never ever use this vendor again, so we won’t face this trouble next time. Haven’t seen Bernie Su and Hank Green’s Pride and Prejudice adaptation? Check it out for free at YouTube and LizzieBennett.com. Billy Bookcases in Brown/Black by IKEA to complete my Beauty in the Beast / Biltmore Estate Library (and also the house to hold all said shelves). There are never enough books, and there are never enough book cases to put them in. TIFIOS Preparedness Kit by DFTBA.com is a brilliant idea that yes, all of the New York Times Best Seller for ever readers (and Nerdfighters) will a) see the movie at least twice and b) cry the whole time. I also love that this is a brain child of Papa Green (The Vlogbrothers / DFTBA Record Owner / TIFIOS’s author’s Dad). Muggles into Wizards Hoodie by DFTBA.com and the http://thehpalliance.org/ because um, yeah… Books do turn Muggles into Wizards, and kids into readers, and readers into agents of social change. Halve Fish Bowl bookends at Generate, though I wouldn’t fill them with fish (dead fish sort of kill the library’s ambiance). These would be awesome repositorys for random collections like sea shells, matchboxes, ticket stubs, or whatever little trinkets you have lying around. 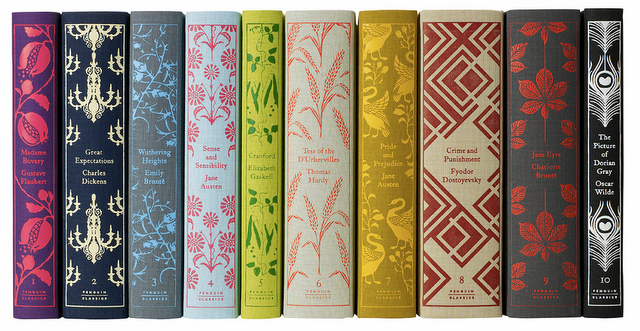 Classic Clothbound Editions and Drop Caps Editions by Penguin because they are beautiful. And yes I know these are books, but they are extra, erroneous books because I already own most of them in less pretty editions. But they are so pretty! Pride and Prejudice by Postertext a picture drawn with the text of the work, which occasionally results in a piece so beautifully representative that I can’t imagine how they do it. I like this classic Austen version, because it fits the them of my current home, with the silhouettes- but I would really love any of them. I am Figuratively Dying Mug at Literally Gift Company because I would literally die laughing if my boss asked for an explanation. She doesn’t always get my booky jokes. Stack of Books Earrings at Literally Gift Company so I can complete my Mrs. Frizzle impression. I’m a big Mrs. Frizzle fan, and I sort of want to be a teacher just so I can be Mrs. Frizzle everyday on Halloween. What about ya’ll? Is there anything you are coveting these days?